It is vacation planning time of year. Which means it is busy. Really busy. And it is cold outside. And Winter is hanging on something fierce. 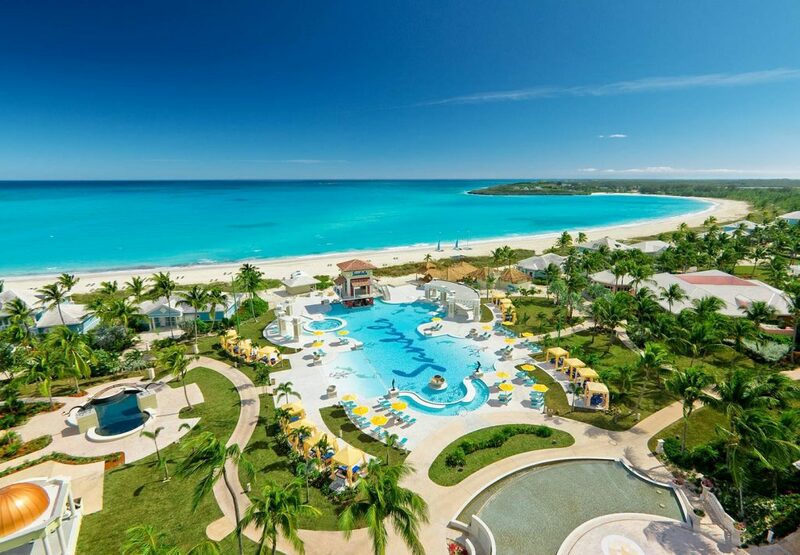 So of course our thoughts drift to tropical favorites and right now we keep thinking about the Exuma all inclusive resort, Sandals Emerald Bay . Why are the Exumas one of our favorite tropical destinations? 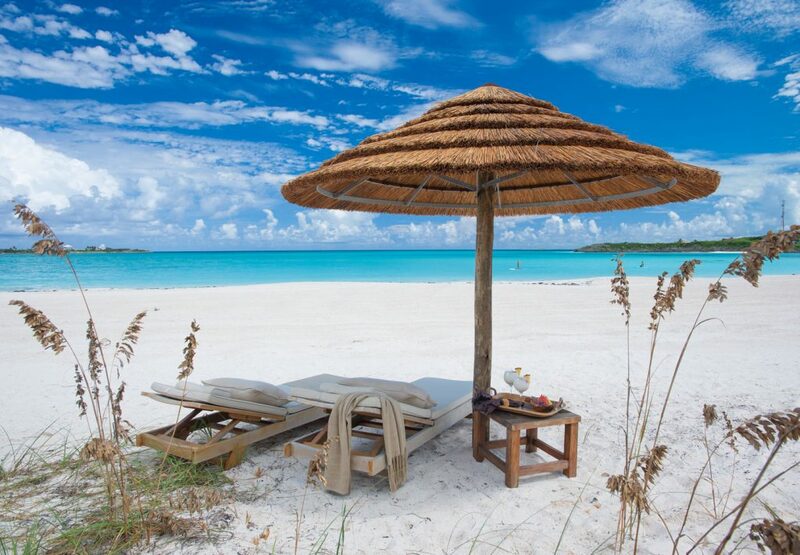 The Exumas are a laid back Bahamian paradise of 365 cays and islands located 35 miles southeast of Nassau. In terms of location they are close enough to the US that you can be on the beach before supper, and enough off the beaten path that you feel like you are a world away from your normal. 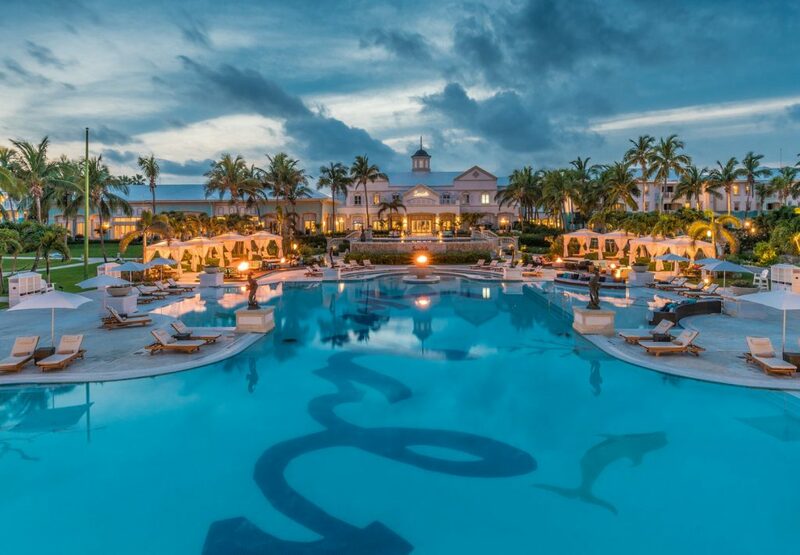 Why is our favorite Exuma all inclusive resort Sandals Emerald Bay? 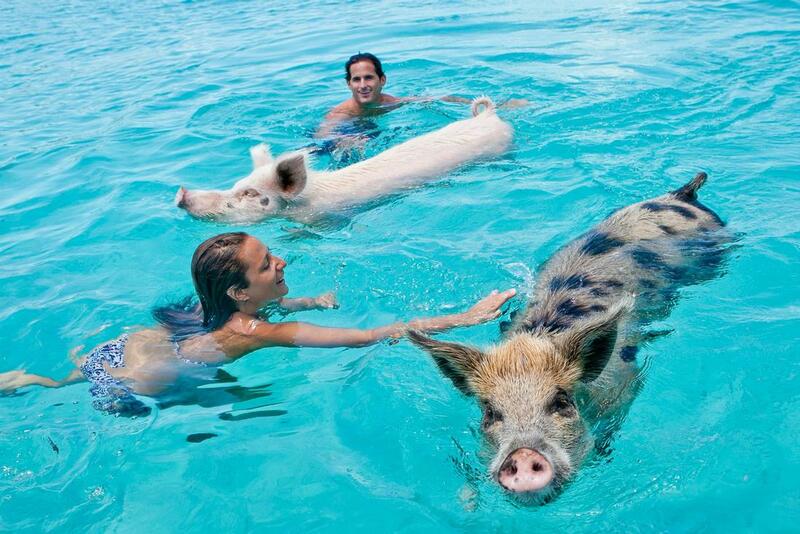 The Exumas are known as a playground for the rich and famous. 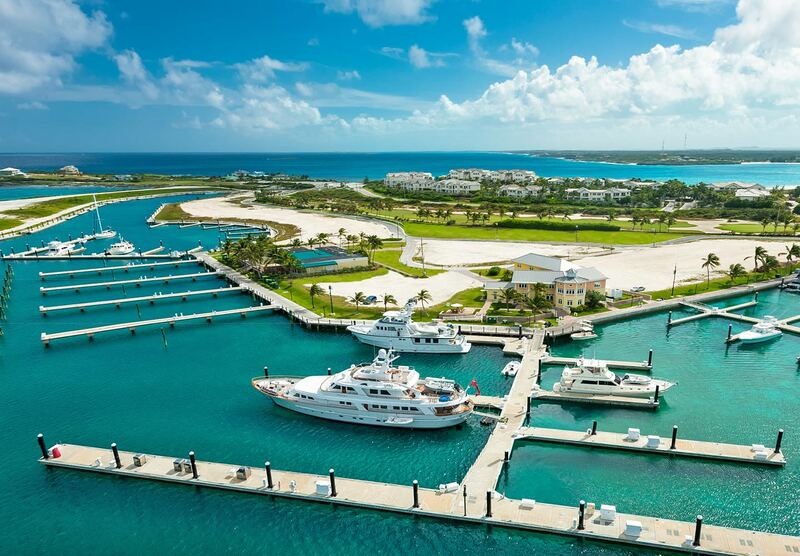 There are a number of ultra private, ultra luxurious celebrity homes located here, marinas filled with yachts, high-end beach resorts, private island retreats, and Sandals Emerald Bay is the only luxury ADULTS only, couples only, all inclusive resort in the Exumas. Turquoise water so clear and so turquoise we are nominating it for a hot new Pantone color. 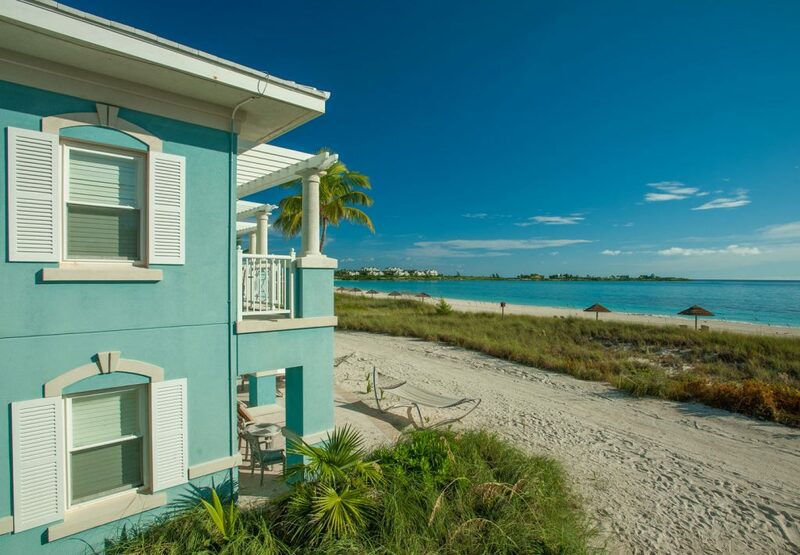 We suggest calling it “Exuma Blue”. Pantone are you listening? Sand. More accurately powder sugar light and fluffy sand. Seriously. Some of the best sand our toes have had the pleasure of meeting. Fishing. This is a fisherman’s paradise…bone fishing, rock fishing, tackle fishing. Kick back with your rod and a cold Kalik and life is as it should be. Private island romance. There are so many little private uninhabited island in the Exumas that you can actually spend a day at one picnicking, relaxing and channeling your inner Ginger and Professor. All rooms are either club level or butler level at this resort. This means every room has elevated service, room service, in room bar replenished daily and either Sandals great Club Level, or Butler Level, amenities. Most rooms here have views of the beach or water. A few have garden views. You can’t go wrong whatever view you have though! Beachfront Butler Villas. Roll out of bed in the mornings and on to the beach. Where your butler can have breakfast waiting…on the beach. H.U.G.E spa. 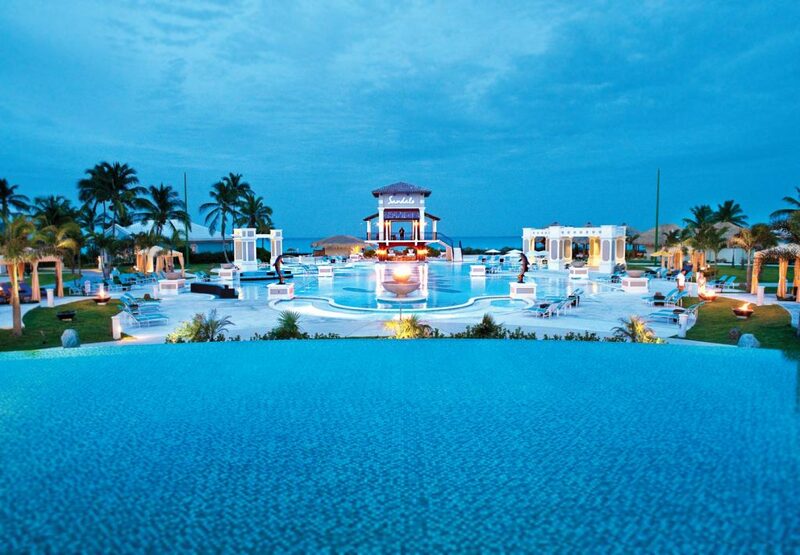 The largest of any Sandals for years, until Sandals Royal Barbados recently opened with their 15,000 square foot spa. It is impossible not to relax in this spa. There is a marina onsite! Yachters can dock and enjoy land for a few days before sailing off to the next adventure. Golf… PGA championship golf in fact. 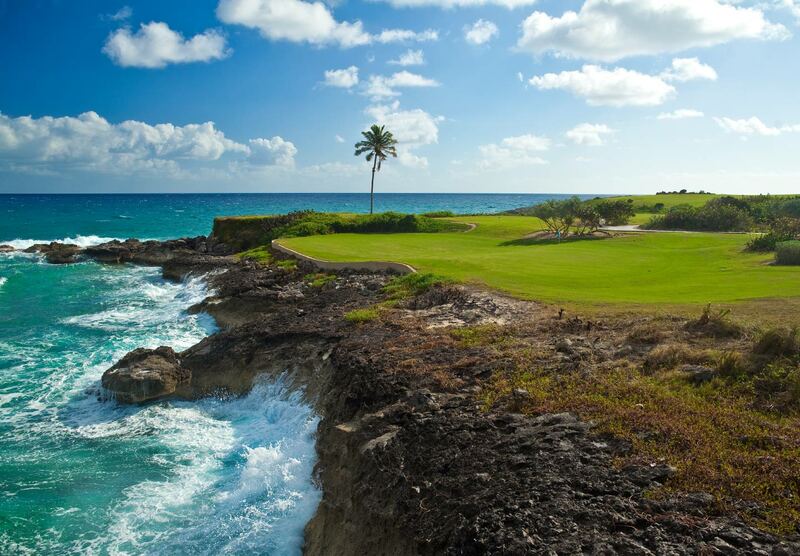 For more details on the Greg Norman golf course at Sandals Emerald Bay you can view the course fact sheet here. Diving. Sandals INCLUDES diving! And the Exumas are a diver’s dream. You can enjoy the included diving at Sandals every day or you can upgrade your experience and purchase wreck dives, night dives, shark dives. The Exumas offer it all. Not your average all inclusive, Sandals includes premium liquor (think Jack, Cuervo, Absolute, Appletons and even better in butler accommodations). Wines are Mondavi. Non-motorized AND motorized water sports (Snorkeling off a dive boat at a reef? Included!). All your dining. Daily and nightly entertainment. Basically Sandals offers all of what inclusive resorts offer, and then they add on things you are going to add anyway, but would pay for at other resorts. Check out all of Sandals inclusions here. The Drunken Duck. We may have done some guest bartending here, we might have enjoyed a little karaoke…or maybe there wasn’t karaoke and we were just singing…because that is what you do in a pub right? We digress. The Drunken Duck is Sandals’ authentic British Pub offering pub food, pub vibes and pub games. Jolly fun! 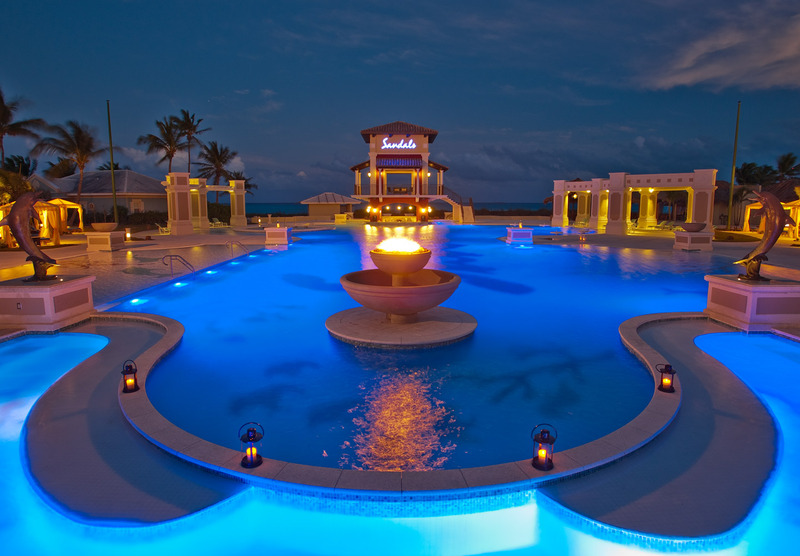 Firepits in the pool. We love firepits no matter where they are, but IN the pool is uber romantic. 11 restaurants with French, Asian, Indian, Italian, even gourmet hot dogs. You need a week here just to experience all the great (INCLUDED) dining options! Emerald Bay is a sprawling resort with something for everyone and the pricing is pretty incredible considering how much is included in your resort package. Not to mention that there are some really great deals to this resort right now. You can check pricing out on this post here. 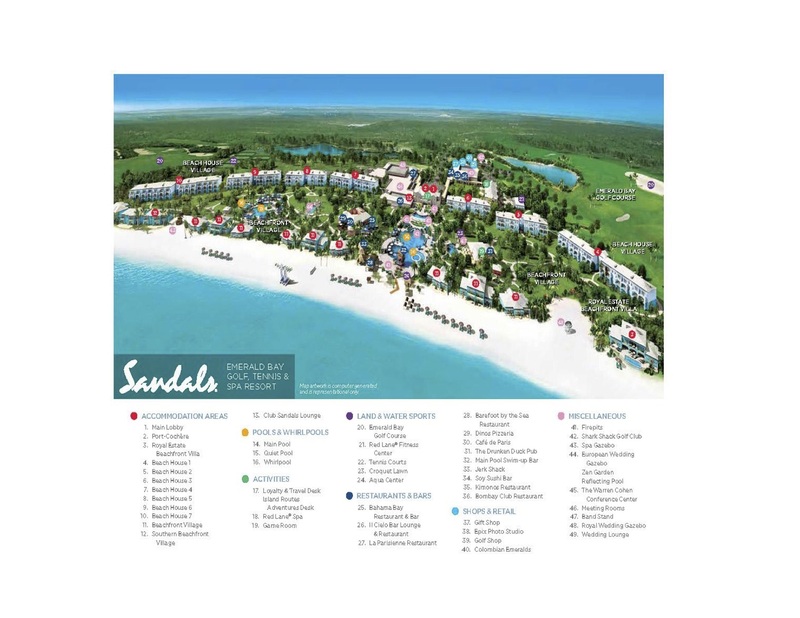 To get an idea of the size and layout of Sandal Emerald Bay we’ve included a resort map here for you. We could go on and on, but this gives you a pretty good idea of why Sandals Emerald Bay is our favorite Exuma all inclusive resort and why we love memories of Exuma on cold days (winter OR spring). Special shout out to Sandals for the amazing resort photos they let us use here! For readers who want to see our personal Sandals Emerald Bay photos check out our Facebook album here. If you want more details on Sandals Emerald Bay, need help selecting the perfect room category, arranging a split stay between Sandals Emerald Bay and Sandals Royal Bahamian in Nassau, or if you have any questions regarding Sandals Resorts in the Caribbean feel free to call us or click the “Contact a Sandals Specialist” button to contact us! This entry was posted in All-Inclusive Resorts, Blog, Sandals Resorts. Bookmark the permalink.